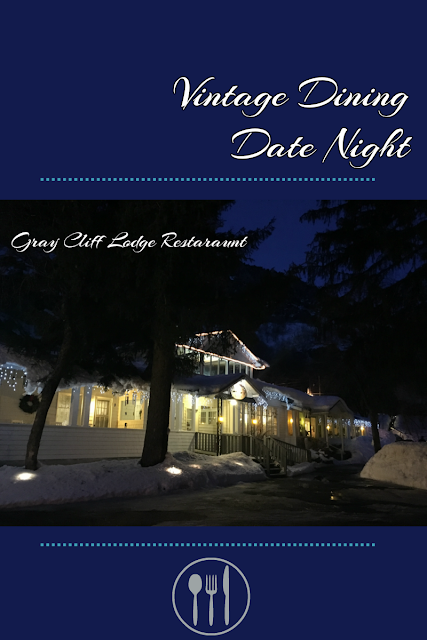 Gray Cliff Lodge Restaurant in Ogden Canyon is a little local treasure perfect for a date night outing. Mr. Awesome and I like to drive through the winding Ogden Canyon to one of the trail heads and go for a hike before going to dinner at Gray Cliff Lodge Restaurant. 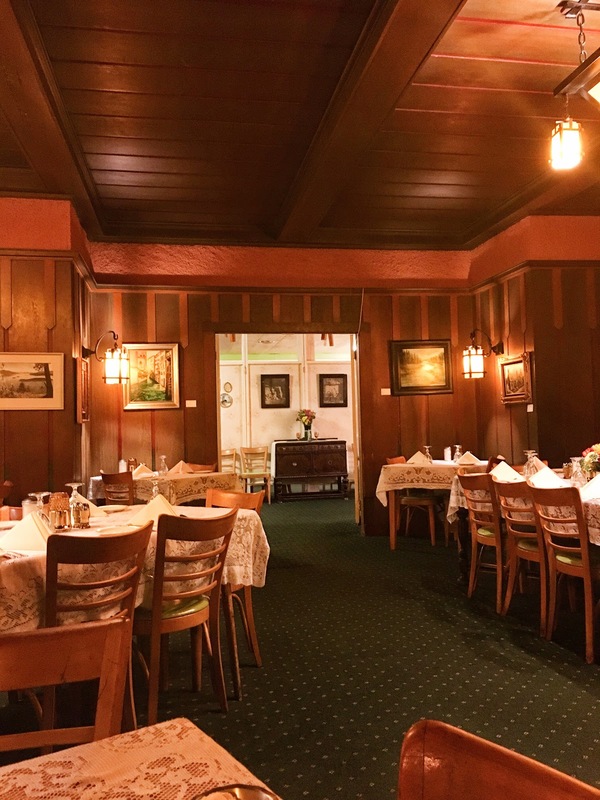 They've been a restaurant since 1945 and you can feel the history in the beautiful building, built in 1912, and in the traditional fare. You might have seen our post about the Ogden Canyon Cinnamon Rolls and wondered where these cinnamon rolls exist outside of a recipe? Perhaps you're not a baker and would like to partake without having to bust out the stand mixer? Well, if you live in Utah or have plans to visit in the near future, you're in luck. The Gray Cliff Lodge Restaurant serves these delightful dinner cinnamon rolls as an accompaniment to any meal. A dimly lit cinnamon roll. Gray Cliff Lodge Restaurant might not be to everyone's taste - they are vintage dining from top to bottom. First of all, come hungry, because your dinner includes your choice of fruit cocktail or tomato juice, followed by soup or salad, the famous cinnamon dinner rolls (I think there are other rolls, but I was too enamored of the cinnamon rolls to notice), then the entree, and finally dessert. That's right, dessert is free with dinner! Try the oatmeal pie. It sounds weird, but it's awesome! Second of all, because this is vintage dining, don't expect haute cuisine or farm to table sourcing. When they say traditional American cuisine, that's what they mean. This is tasty, filling fare that's heavy on the gravy and frying. The trout is superb if you're looking for a lighter option. Finally, the service is amazing. The water is refilled before it has a chance to dip below 2/3rds full. And the waitress we've had the last few times took our orders by memory, a dying art. I can barely remember where I parked my car. That's right, it's fruit cocktail right from a can with a scoop of sherbet and a maraschino cherry. This goes against all the modern food trends, but I don't care! I loved it! 1950s dining at it's finest. Cream of brocolli soup with a club cracker. Catch me as I swoon. The entrance to the dining room. 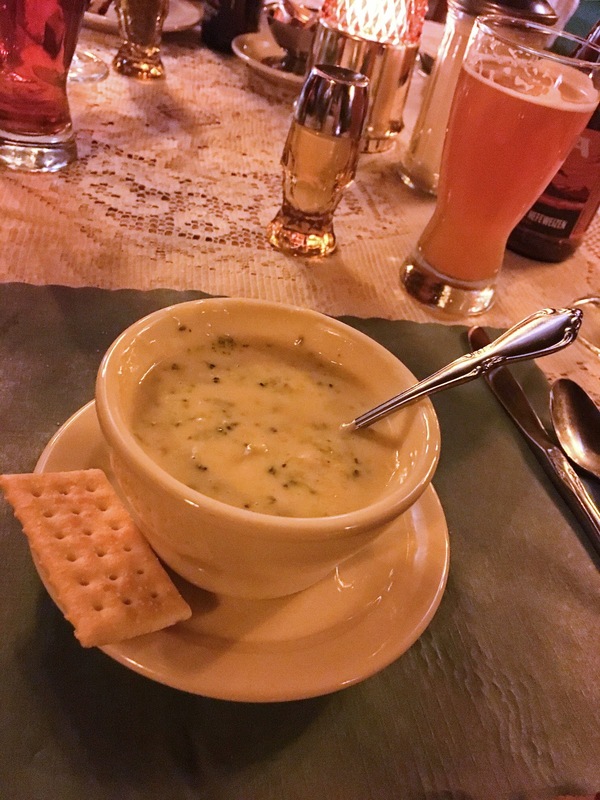 I won't say that Gray Cliff serves the best of everything I've ever had, but for a fun dining experience, it's definitely worth a trip. Also, if you're frugally minded like myself, you can get a deal at restaurants.com. They also have a Sunday brunch, which is refreshing in a community where Sunday dining options are sparse. We went to Sunday brunch with a group of friends and I can't recommend it. The setting is lovely, the service is good, but the brunch was meh. It's a buffet and the eggs were really soggy and not very warm, there was no bacon, the rolls were tough, and the sausage wasn't warm either. It also isn't an extensive spread. Stick to the dinner experience.